If you're a fan of old school or green fragrances, you have to sample Acqua di Selva, if you haven't already. I've read that a lot of native-born Italians look at Acqua di Selva as a tacky joke, a cologne that only tourists care about. I'm not from Italy, so I guess it's okay for me to wear it. For me, this fragrance is something special. 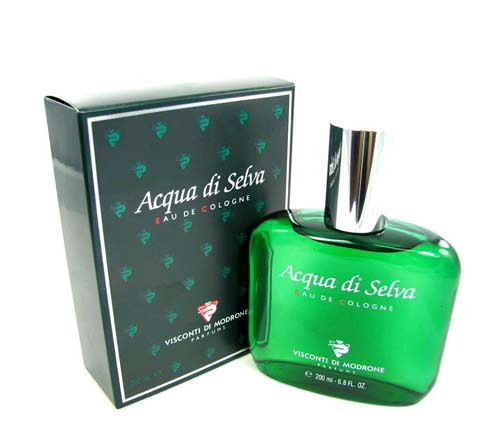 Acqua di Selva is a classic fougere, with a whole lot of things added to it to make it smell as green as possible. There are some good dry herbal notes like basil, thyme and rosemary, as well as geranium, added to the basic lavender-tonka-oakmoss accord to give this an intense green scent. Even the citrus notes in the opening smell green. There's also a shot of pine in here as well, though it's not in your face like it is in scents like Fou d'Absinthe or Quorum. Comparisons to Pino Silvestre are spot on. This is heaven for me. However, the two smells that define Acqua di Selva for me are oakmoss and vetiver. They are all over this fragrance. The oakmoss is aggressive and rich, to such an extent that if you don't love oakmoss - and I mean love it, not just like it - you probably will not enjoy Acqua di Selva. The vetiver has a soil-like earthiness, as opposed to being sharp and astringent, and it gives the fragrance a leathery smell. In fact, the oakmoss and vetiver are so dominating, Acqua di Selva smells almost like a greener, more stripped down version of Drakkar Noir. I love it! Though it's not a powerhouse by any means, I find its strength to be very good, considering it's only an acqua di colonia. Reviews I've read complain about poor longevity, but I get about 7 or 8 hours from it, with good sillage. Nothing wrong with that. I don't care if Europeans scoff at Acqua di Selva, or that it's inexpensive. Laugh all you want - it's still one of the best green fragrances I've ever worn, and is one of my favorite fragrances, period. You're right about the oakmoss - it's almost brutally strong in this fragrance so if you aren't a fan of moss, avoid this like the plague. For me who does like mossy, green aromas Acqua di Selva is a winner. In THE PINK PANTHER, when David Niven opens his medicine cabinet, he's got a bottle of Acqua di Selva on the shelf. Enough said. If you think that's cool, check out the picture I just added to the review - that gallon jug of Acqua di Selva sitting on the bathtub next to Al Pacino. I read that this pic is from his movie "Bobby Deerfield". That bottle shows up on radar, I bet. Hell, it would show up on satellite surveillance. You ended 2012 on a high note. Ha ha, sorry about that! It's not your food. I was working on another review the other day, wasn't paying attention and accidentally edited this review by putting in a 9/10 rating. No, AdS deserves a full 10/10. Have you compared vintage to new versions? Thanks and Happy New Year! No I haven't, and I'm not looking for a bottle of the old stuff either. The current juice suits me just fine. I've been burned too many times now with lousy reformulations so I guess it's my "New Year's Resolution" to avoid them unless there is reason to think they are okay. That is true for many Guerlains, IMO, though that doesn't mean I think they smell exactly the same. And I think the Samsara reformulation was awful. If I can get the original of AdS I'll come back here and let you know what I think. Keep up the good work in the new year !